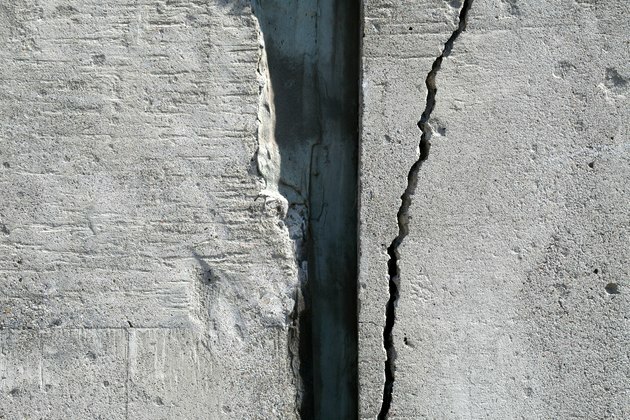 Concrete strength is enhanced with the addition of steel, combining to form reinforced concrete. Rebar is sized and placed according to the design of the structure and site conditions, but minimum standards provide guidance. Consult with professional engineers or architects, or experienced contractors, before proceeding with a reinforced concrete project. Steel is placed in concrete to add tensile and shear strength -- resistance to forces stretching it apart -- to its inherent compressive strength -- resistance to forces pressing on it. The steel has to be placed correctly in the concrete to resist compressive, tensile and shear pressures and help control cracking. Horizontal reinforcement adds resistance to tensile forces, and vertical reinforcement improves resistance to shear forces. Reinforced steel is manufactured as bars (rebar) or welded wire mesh. The deformations in rebar bond to concrete, and the strong bond enables loads to be transferred between the two materials. When steel makes contact with concrete, a non-reactive film develops on the surface of the rebar that helps protect it from corroding. The depth of concrete cover over the steel is an important factor in its placement so that it doesn't corrode. Rebar is placed horizontally and vertically in the wall, in a grid pattern. As a minimum, #4 rebar (1/2 inch) is spaced vertically at 36 inches on center, continued to within 8 inches of the top of the wall, placed on the tension side -- the inside face -- of the wall. The cover required is 2 inches for foundation walls, or walls exposed to weather, and 1 1/2 inches for walls that aren't exposed. Horizontal spacing for #4 rebar is a minimum 2 feet, within 12 inches of the top and bottom of the wall. The concrete structure is designed to act as a single unit, though parts of it are poured separately, resulting in a construction joint. The rebar has to carry through the joint for continuous resistance to stresses. It splices with the rebar on the other side, overlapping for a specified distance. Generally, the bars overlap by a minimum of 2 feet. The same overlap is required for rebar ends and rebar that turns a corner. What Constitutes a One Hour Fire Rated Wall? What Is ANSI Class 150?